Just sold all the Airport stocks and bought more of TA Enterprise. I have bought some of TA Enterprise shares before and it was proven to be largely unsuccessful over the short run. The shares which I have bought now dropped to RM0.695. As mentioned before, TA is a defensive stock with strong overseas assets. With the decrease in Malaysian currencies, I would think that these overseas assets would worth more. However, as it also has substantial foreign currencies loans, I would believe those differences would not be that substantial anymore. It sort of even out. The announcement made yesterday over its latest quarterly performance, I guess cause its shares to drop 7.33% today. 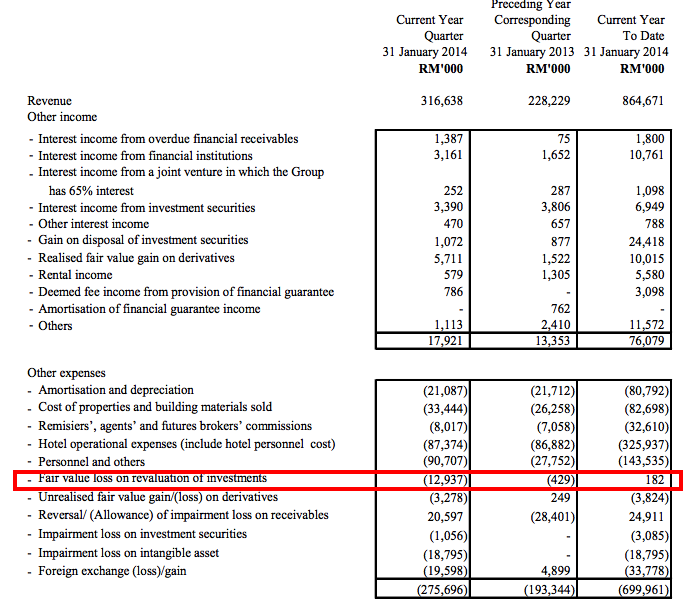 This is because it registered a loss before tax of RM23.8 million for the quarter. However, while we are shocked by this, do read what it has to announce. Let's just focus on the two divisions - investment holding and credit and lending. Investment holding division reported loss before tax of RM66.7million in the current year’s fourth quarter, as compared to profit before tax of RM34.3million in the previous year’s corresponding quarter. Despite higher investment interest income, the current year’s fourth quarter results was dragged down by foreign exchange losses realized upon the dissolution of foreign subsidiaries and fair value loss on investment securities. For the current year-to-date, this division reported loss before tax of RM58.0million, as compared to loss before tax of RM2.6million in the preceding year. Despite higher investment interest income and fair value gain on derivatives, current year’s loss before tax was higher primarily attributable to higher fair value loss on investment securities, and acquisition related cost incurred. For the current year’s fourth quarter, credit and lending division contributed RM29.9million profit before tax to the Group, as compared to profit before tax of RM72.2million in the previous year’s corresponding quarter. Despite higher investment interest income, current year’s fourth quarter results was dragged down by higher fair value loss on derivative and investment securities, and lower loan recovery income. This division achieved a current year-to-date profit before tax of RM154.9million, as compared to RM107.3million in the preceding year. Despite higher fair value loss on derivatives and investment securities, the division’s performance was boosted by loan recovery, foreign exchange gain on translation of AUD and CAD denominated balances, and higher investment interest income. Credit and lending For the current year’s fourth quarter, credit and lending division contributed RM68.1 million profit before tax to the Group, as compared to profit before tax of RM1.7million in the previous year’s corresponding quarter. For the current year-to-date, this division achieved profit before tax of RM104.0million, as compared to RM19.4million in the preceding year. This division enjoyed higher revenue and profit before tax resulted from loan recovery, gain on sale of investment securities, investment interest income, and foreign exchange translation gain on CAD and AUD denominated inter-co balances. What do we noticed from what was picked up? These are cyclical in nature mainly due to fluctuations in currencies exchange and investment securities as TA held a large portion of its assets through investments securities. See the difference! These are mainly accounting in nature as long as these investments are to be held over a longer period. Unfortunately most retail investors just panic and sold down the counter for no apparent reason. The other thing I noticed was the significant higher tax paid in Q4. 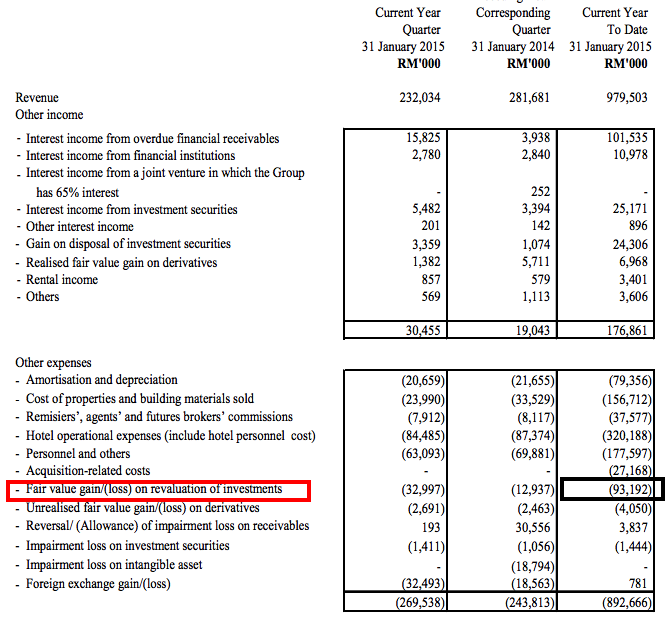 I think the best way to avoid the smoke screen of income statement is to look at cffo, on 4 yrs average cffo is around 200m, which means that the management is able to generate cash long term stablely. with the current price of rm0.7, p/cffo is around 5-8, which is a very good bargain for such a asset rich company. its hotels and investment property like Menara TA are running major refurbishment, so there would be hiccups of recurrent earning this year. TA still on a downtrend. Guess the coming Quarter report wont be good. Bursa limits information to 5 years ONLY?